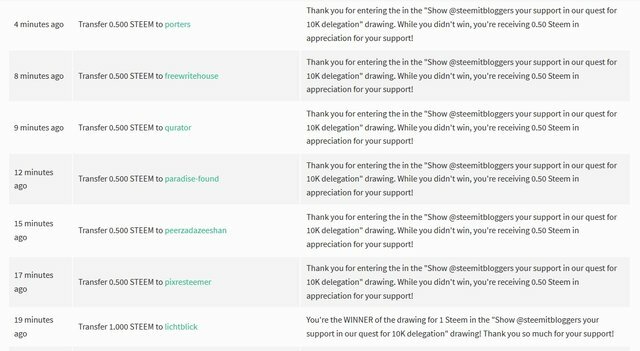 Of those 91, there were 13 different posts done by 7 different people who are not part of the Steemit Bloggers community, including 2 (@qurator and @freewritehouse) who were also in the running, so they were our competition! While we fell short in the voting during the very last moments due to a Herculean effort by the @votovzla team (and CONGRATULATIONS to you all!) , we still won in so many, many ways - including the HUGE announcement that @bluemist (via @appreciator) has delegated 10K to @SteemitBloggers for 6 months! Okay, now for the drawing. Thanks to the awesome generosity of @foxyspirit, who donated 1.5 Steem yesterday, the total prize pool is 3 Steem! 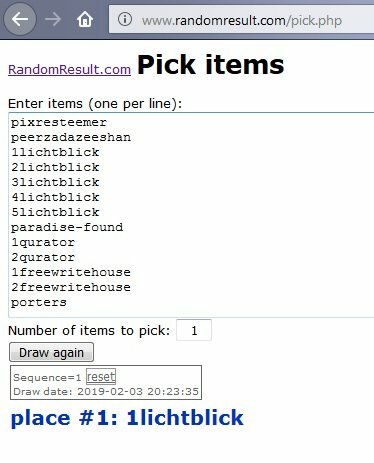 I decided to do a random drawing for the winner of 1 Steem, then send 0.50 Steem to the other 6 participants. Congratulations to @lichtblick!! 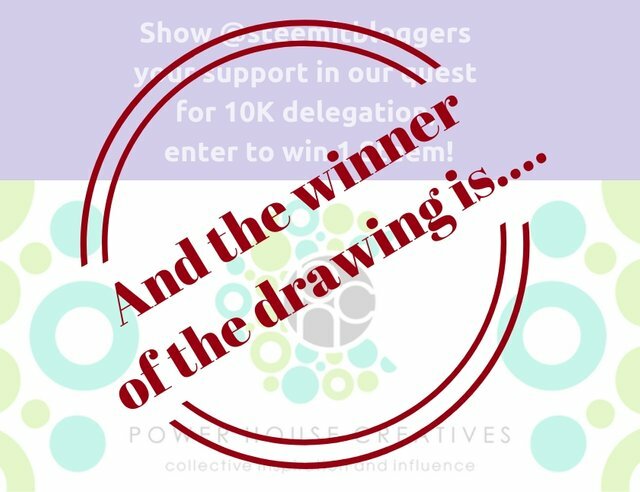 No big surprise you were the winner, given how many times you posted on our behalf. Thank you again for your wicked awesomesauce support! I'll be sending along your 1 Steem in the next few minutes! And to @pixresteemer, @peerzadazeeshan, @paradise-found, @qurator, @freewritehouse, and @porters - thank you also for your amazing shout outs! I'll be sending along 0.50 Steem to all of you also in the next few minutes. FANTABULOUS Power House Creatives family! Oh that is awesome and much appreciated.